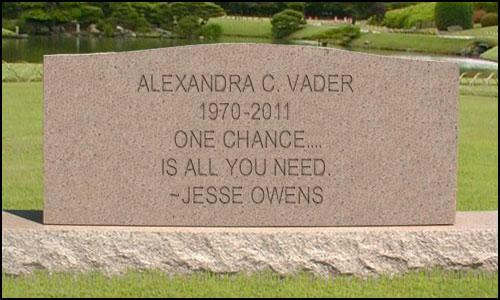 Alexandra Catherine Senape Vader, 41, passed away today from complications due to heart failure. She leaves behind her husband of 12 years, Theodore Clark Vader and 2 children, Jakob Riley Vader, age 10 and Owen Morrison Vader, age 3. She was attending the University of Central Florida working toward her degree in English Literature and Creative Writing and had earned her A.A. degree from Valencia Community College in December 2010. She had been working on writing a book for the past 15 years, but never was able to complete it. Born in Washington D.C., she was from Hazleton, Pennsylvania and resided in Casselberry, Florida. She enjoyed writing, family, the beach and music. In lieu of flowers, please send donations to the American Heart Association. 41….I thought that was so very old when I was 20 something. There were years to do all the things I wanted to. I had all the time in the world……tick, tock, tick, tock…..
Time is a luxury. A luxury we take for granted. “I’ll do it tomoorw….I will see my friend another time….I will call my sister next week….I will send my nephew’s gift next month….” These are the things we tell ourselves. This is what we say to justify our busy schedules and jumbled lives. It passes so quickly. I have said this before……last night, I went to bed 21 and woke up 41. I have so many deeds left undone…….it pains me to think of them all. As I sit here, wondering why I let so much time go by, so many accomplishments left unfinished….I wonder if I will ever do it all. I will write this obituary again one day. Not the real one…the one that was meant for me….the one that may be the groundwork for the real one. We shall see.